It's the contrast between these two cards that sticks out most to me: female and male, casual and formally dressed, standing and seated, flowing and rigid, flower wreath and crown. The page parties with her creatures; the Emperor commands his. A juxtaposition in concepts as well, here. The page is about creativity, about imagination, inspiration, youthful and naive energy. The page begins, playfully touching on this and that - she can visualize ideas that others would dismiss as impossible. 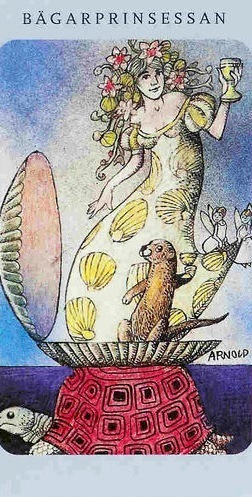 She stands in a sea shell, bringing to mind the famous Botticelli painting of the birth of Venus, or Aphrodite. She rises from the waves, with so much romantic notions - the playful faeries of so many tales. A tortoise carries her, and why not? What rush is there, why not take your time and see and imagine and explore? A far cry from the Emperor, with his ram-headed stave and throne, his eagle shield, his crown of power. 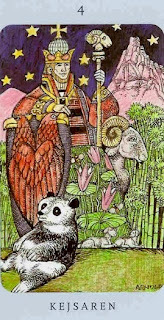 Since getting this deck I've wondered about that panda, something that distinguishes this Emperor card from most others. Apparently, in Ancient China emperors were known to keep them as pets. These days, endagered as they are, it takes a fair bit of organizes effort to keep the species from going extinct, I suppose. The emperor sits up straight, and rules over lands, mountains, sky and stars. Discipline, authority, responsible management of your resources and time. The conflict between these two has, I suppose, always been a sort of theme in my life. Part of the reason I don't have the negative reaction to the Emperor archetype that many in tarot seem to is because I have always WANTED to have a firm grasp on the best of what he represents: discipline and self control, getting things done, organizing properly what needs to be organized, authority of a reasonable sort. I try and I try, and yet nonetheless so often I find myself rather stuck in the position of the page, a scattered kind of brilliance, imagination without much direction, so many ideas on so little of the concrete to show for it. A source of frustration in particular as of late. So many examples abound. I am quite clearly more advanced than my classmates in Arabic. I spend hours listening to news clips, political talk shows, historic documentaries to improve my comprehension skills. For a long writing assignment I wrote literary analysis (former English major skills, ha) of Soviet dissident literature that I like...in Arabic, and it was GOOD if I do say so. My professor is impressed with my enthusiasm for learning the language, and yet she has told me that my grade will suffer despite that because I cannot keep from being constantly late. A valid criticism indeed. Another professor is consistently impressed with my written work, but is currently displeased with me and gave me a lowered grade on an assignment because I submitted it twenty minutes after the stated deadline...and again, quite right of him. I don't mean to do this. This isn't me not caring - I write my to do lists and I try and yet things slip away and slip away and slip away. How often to I forget to do something, forget to bring something, lose something? Constantly. I feel like I put far more deliberate effort into trying to be organized and disciplined than many people, and even so I am far more of a flaky, scattered mess. Without some firm-handedness to things, riding that turtle will get you exactly as far as one might think - very close to the same place you started. How does one find the proper balance then? How? Which makes me think of a need to be compassionate with yourself, but besides making lists, budget your time during the day, and make a commitment to spend a certain amount of time on one specific thing. Multitasking seems to cause people to lose their focus. A watch (or phone) with an alarm might help too! Hang in there and don't give up on yourself! Still, I wish you well in finding a balance that feels healthy and nurturing to you! Just wanted to add... You have so many WONDERFUL qualities and talents - don't let the "all or nothing" thinking make you forget that!